Dr. Oliver Williams Receives Lifetime Achievement Award! Alliance for HOPE International Casey Gwinn, J.D. and Dr. Oliver Williams at the 18th Annual International Family Justice Center Conference in Fort Worth, Texas. 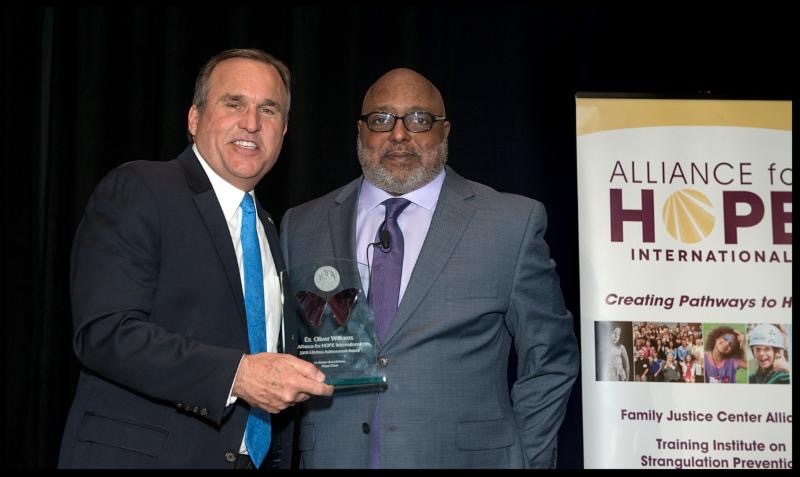 Dr. Oliver Williams, the founder of the Institute on Domestic Violence in the African American Community (IDVAAC) today received the 2018 Alliance for HOPE International Lifetime Achievement Award in Fort Worth Texas in front of 700 child abuse, domestic violence, sexual assault, elder abuse, and human trafficking professionals from across the country and around the world. “Oliver Williams has changed the world for thousands of victims and offenders in the course of his amazing career. He is without a doubt one of the most transformational leaders we have ever worked with,” said Alliance President Casey Gwinn. Oliver J. Williams, Ph.D., Professor of School of Social Work has had a distinguished career at the University of Minnesota, in St. Paul. He was the Executive Director of the Institute on Domestic Violence in the African American Community (IDVAAC) From June 1994 to September 2016 and served as the Project Director of the African Immigrant and Domestic Violence Initiative, 2010 to 2016 and the Safe Return Initiative that addressed prisoner reentry and domestic violence from 2003-2016. (San Diego, CA) The University of Oklahoma today released their evaluation report of seven California-based Family Justice Centers and Dr. Chan Hellman praised the Family Justice Center model as a “source of hope and wellbeing for survivors of intimate personal violence and sexual assault.” The study was funded by Blue Shield of California Foundation as part of their long-term support for the development of Family Justice Centers in communities across California. Dr. Chan Hellman, the Director of The Center of Applied Research on Nonprofit Organizations – the leading Hope Research Center in the country – and his research team, working closely with Alliance for HOPE International and its Family Justice Center Alliance program found statistically significant increases in Hope, Resiliency, Satisfaction of Life, Emotional Well-Being, and Flourishing in the lives of survivors after receiving services in Family Justice Centers in California. The seven participating Centers included the: Contra Costa County Family Justice Center (Richmond, CA and Concord, CA); San Diego Family Justice Center (San Diego, CA); Alameda County Family Justice Center (Oakland, CA); Strength United Family Justice Center (Van Nuys, CA); Stanislaus Family Justice Center (Modesto, CA); Sacramento Family Justice Center (Sacramento, CA); and Riverside County Family Justice Center (Murrieta, Indio, Riverside).